It’s the most wonderful time of the year, and I’m not talking about Christmas; I’m talking Halloween! Halloween swaps have been picking up, and Halloween projects are showing up on the boards. Yay, it’s time to get haunting! 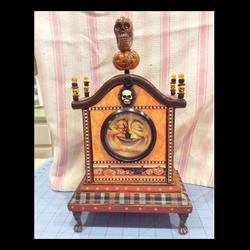 It’s always Halloween time when you have a themed clock, like this one by KarenLouiseM. She included so much detail: various patterns in black and orange, vintage images, and skulls and pumpkins everywhere. It’s perfect! 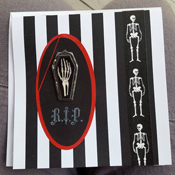 TheMistressT has been busy making Halloween greeting cards to haunt her friends and family. Me-OW! 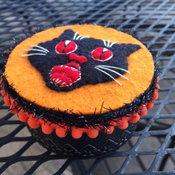 This vintage cat box practically screams Halloween. alwaysinmyroom decorated a small round box with felt, papers, and various trims. 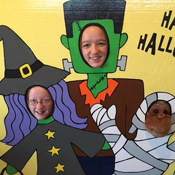 patty_o_furniture knows how to liven up a carnival or party: with a fun Halloween themed photo board. No costumes required! I had to get into the act as well, making a set of “teeny tiny Halloween shrineys”. 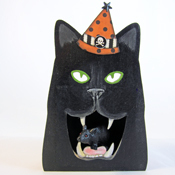 This little black cat shrine stands just under 6″ tall. Halloween is right around the corner. Are you scared yet? Make sure to visit our Halloween boards for the latest in Halloween costumes, treats, and decor. « Meatless Monday: Unicorn Smoothie!